12 Feb Awarded Best White Wine in Japan! This past Friday Brett Butcher, Director of Soumah Wines, attended the awards ceremony for the 21st Japanese Wine Challenge in Tokyo, Japan. He was thrilled to accept the coveted Riedel Award for Best White Wine and Best Value White Wine for Wines Above 5,000 Yen for Soumah’s 2017 Equilibrio Chardonnay, competing against many international entries. This is Asia’s oldest and most prestigious wine competition and along with receiving the award, the highlight of the evening was the presence of Her Imperial Highness Princess Takamado, wife of Prince Takamado (now deceased) who was seventh in line for Emperor of Japan and cousin of today’s Emporer. This is a significant achievement for Soumah in such a competitive international market. If you would like to experience this award-winning wine, please click here to order. 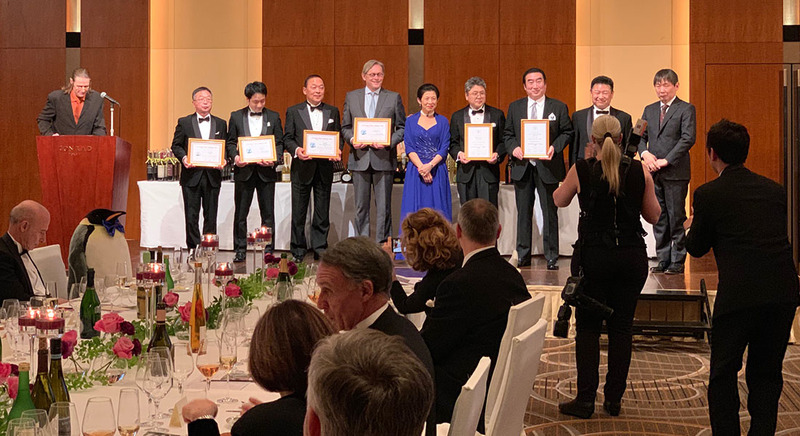 Image: Brett Butcher (fourth from left on stage) receives award for Best White Wine in Tokyo, standing next to Princess Takamado.